Chuckie Egg... with more colour! Hopefully this now makes the Beeb version a contender for the Best Version Ever. Last edited by Rich Talbot-Watkins on Tue Dec 20, 2005 11:01 am, edited 1 time in total. 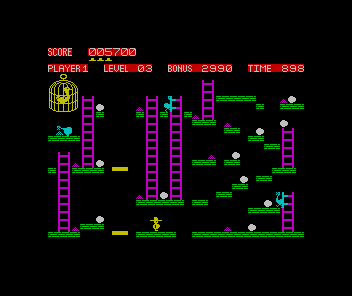 Dont see the diff with beeb version and crap speccy version, apart from red background 4 score, and the ladders change colour when u/geese go past them. So it really worse, and ive played it on the speccy MESS emulator, what a lot of crap! Cant even get up ladders properly, and also jumping! Last edited by Rich Talbot-Watkins on Mon Aug 07, 2006 8:52 pm, edited 1 time in total. Re: Chuckie Egg... with more colour! Rich Talbot-Watkins wrote: Hopefully this now makes the Beeb version a contender for the Best Version Ever. Well, I think it's safe to say that the majority of people reading this forum probably had the beeb version pegged as that already, even before your enhancement .. I've added your loader to my site, Rich - it is definitely, most awesome. To save typing, there's a .SSD image of the latest patch provided with the Resource Kit from my site and I'll send it on to Dave for inclusion in the STH archives as well - probably under the Cheats/Ready Trained section I'd imagine. I have a better patch than the one above, which doesn't require the raster interrupt as before, but actually sneaks an extra colour into the palette. This new patch is the version on the Chuckie Egg site. We load the executable &2000 bytes higher than its load address to allow room for that Basic loader. All the code at lines 110-160 is concerned with is relocating the executable down to the right place (quickly) and running it. These poke new colours into the palette used by the game. The other palette entries echo these colours in appropriate ways. Since all sprites are EORed on the screen, other colours will arise, e.g. when a cyan bird climbs a ladder, we will get pixels in colour (8 EOR 2)=10. Hence the game sets colour 10 to cyan so we don't notice these artifacts (birds appear in front of ladders). Now, it turns out that eggs have an independent palette entry (colour 1) to the main character and the big bird. This is so the big bird doesn't overprint eggs and leave a black egg-shaped hole (4 EOR 4 = 0). But this means we can trivially set this palette entry to colour 7 instead of 3 (?&4B7E=7). Voila, white eggs. It also turns out there's an overprint which is never possible - cyan birds over green platforms (I think this is true anyway?). This corresponds to colour 11 (8 EOR 3), so we'll define this as red (?&4B88=1) and print our status sprites in this new colour. This is a cosmetic change. We have changed colour 1 to white from yellow. 2DBE is a generic routine which takes a colour in ?&7F, a sprite number in A, and coordinates in X,Y, and draws a sprite. By changing LDA#&02 to LDA#&20, we plot the sprite in colour 4. (The value used is the one which would set the leftmost pixel of the byte to the desired colour in MODE 2). This pokes a routine which appears to print the score for the first time. We want white scores, so we need to overprint the red background in colour (11 (red) EOR 1 (white)) = 10. This corresponds to a screen byte value of 136. This does mean that scores not on a red background (i.e. other players') will appear cyan (colour 10), but hey-ho, it's all a bit of extra colour isn't it? My assembler routine just saves the colour at ?&7F, sets it to colour 10, calls the original routine, and then restores the old value of ?&7F. This seems to work very nicely because Chuckie Egg never touches the memory at &380..&3E0, so we're free to fill it with any patch code we need. It also turns out there's an overprint which is never possible - cyan birds over green platforms (I think this is true anyway?). Bird in the bottom right hand corner. Well worth upgrading your original CE disk to this ... ! Going a wee bit off topic... did anyone ever get past the third set of eight levels (i.e. past the set with the chickens only, then the set with the crazy duck only, then the set with both)...? I could get on to those levels but not sure how far into them I got, probably same as you. However I'm sure my nephew got a fair way into them. Levels 1-8: First time round, there were two or three hens per level. Levels 9-16: The second time around the duck came out of the cage, and would dive-bomb you all the time. Levels 17-24: On the third time round, Harry has to avoid both the initial hens and the duck. Levels 25-32: The fourth time round introduced the full compliment of five hens per level, making it even harder to avoid the duck. Levels 33-40: Finally, the last set through had all five hens walking at top-speed, as well as the duck. This last set was repeated all the way through until the final level (255, displayed as Level 0) - the only thing that changed from here was that the time available was reduced until it reached 100, which made it ridiculously hard to complete a level without losing a life. P.S. I got past level 40 on my own, but getting to level 255 required the use of a level select - like the one built into the modified version of CE described in this thread! Just in case anyone's interested - Rich's Chuckie Egg colour hack was pictured in Retro Gamer's Issue 40 The Making Of... Chuckie Egg article, tho he wasn't actually namechecked. I tried the CPC version of Chuckie Egg recently and it is very similar to the BBC version but with more colours. The levels are squashed slightly to fit into 320x200 and if you jump and bang your head on the platform above you bounce off it downwards. Not quite as good as Rich's extra colours version, but definitely better than the Speccy one! I just noticed that the CPC version has exactly the same problem (the screenshot above, by some complete fluke, demonstrates exactly the scenario described above!). I'm sure when they wrote the CPC version, they decided to make exactly the same improvements as I aimed to with my patch! I'm just wondering why I didn't change the grain to red. I can't see any particularly reason why it shouldn't have been possible. Maybe I'll take a look at that one rainy day. I think I can answer that. The reason you didn't make the seeds red at the time, was probably because you were imitating the original Spectrum colours, rather than the later Amstrad CPC version. In both the original BBC / Spectrum versions the bird seed was purple. You can see below the Spectrum version colours. There were three differences remaining that I picked up on, that we discussed on the BBC Micro Mailing List five years ago. I think we agreed it would have been cool to have blue on the palette, but you couldn't see a way to add it to the palette at the time. I also asked about switching the lift colours to yellow, but you didn't think that was feasible in a patch then, either. The Spectrum version had to have the lifts and the bird cage yellow to avoid colour attribute clashes. White lifts were probably seen as an improvement. If the cage was another colour the bird would have to be behind the wires. This looks brilliant, will have to download this, looks every bit as colourful as the Spectrum version now. Samwise wrote: Just in case anyone's interested - Rich's Chuckie Egg colour hack was pictured in Retro Gamer's Issue 40 The Making Of... Chuckie Egg article, tho he wasn't actually namechecked. Are you sure? i'm surprised Retro Gamer would even know that Chuckie Egg was released on the BBC given there incompetence and ignorance of BBC Micro (and Archimedes) versions of games. I'm sure. One of their credited sources was my site. If you like this, you might want to check out Chuckie Egg 2009 (Electron) and Chuckie Egg Professional Edition (BBC). The latter includes this extra colours patch along with a load of other stuff. The seed can be changed to red, with the following additional code snippet to Rich's patch. Ta, Rich. An excellent piece of work. Last edited by Samwise on Tue Nov 16, 2010 3:46 pm, edited 1 time in total. I'm surprised it only needs one change - I expected that maybe it'd need two: one where the seed is plotted when the screen is drawn at the start, and one where the seed is erased when it's picked up! @BeebInC, haha. Yeah, they have been a god-send. It's the only way I've been able to keep up with Rich when he's been patiently explaining the code to me. @Rich Talbot-Watkins, yeah I beat you to it - with an insufficiently tested patch. Yes, you're entirely right that it needs two statements. Duly modified above. Sorry, I'm at work and didn't have time to test properly! Hopefully, this one will do the job properly. I figured if we were going to mimic the Amstrad seed colouring, then I might as well have a play to see if we could match the mixed colouring of the status bars in the Amstrad version. Without any Rich-like mad coding skillz, I couldn't match it identically - but I did come up with a couple of alternatives that bear similarities. Dunno if either could be considered an improvement on Rich's original patch or not, tho! Probably not. ...I should probably be shamed to say I preferred the CPC version as a result. I downloaded the 'ChuckieEggProEditionbeta.zip' - all patches in one - lots of fun, thanks! ...no probs, I see how to do that further up the thread but haven't worked out where to add that to the ProEdition. Would someone let me know? The Chuckie Egg Professional Edition beta doesn't quite have all the possible patches in one. It's still in beta. I'll get the finished version out one day. Meantime, I've updated the CE Pro Edition beta disc image to include the red seeds, so just re-download it and you should be good to go!